Is it a toy? Is it a game? 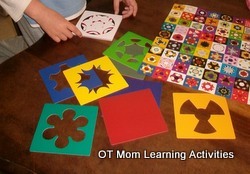 Kaleidograph is an amazing resource for families and therapists. To date, it has received the Oppenheim Toy Portfolio Platinum Award, and it made it onto the 10 best creative toys on Dr Toy and Forbes.com. Impressive! And it is not just for kids! 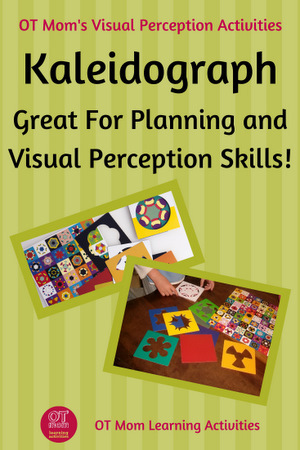 Teens and adults also enjoy this rewarding activity which uses visual perception and planning skills. 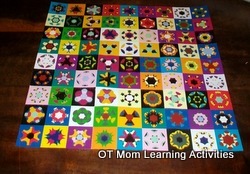 My kids have been intrigued and hooked by the creativity that Kaleidograph unleashes. It is not an understatement to say there are millions of combinations. One small tweak (a different card, or a flip, or a change in orientation) can completely change a design, and my kids have loved experimenting. I was blessed to receive and try out a few different sets for an unpaid review, which made for some very peaceful afternoons as my children lost themselves in a world of color and shape! There are basically 2 ways Kaleidograph can be used. 1) Creative Free Play - where your child experiments and "messes around" with the different colors, designs and layers - this is both exciting and therapeutically soothing! From an occupational therapy perspective, it is the focused design copying that gets me really excited. Planning skills, visual perception and spatial perception are all brought into (ahem!) play, when your child attempts to copy a design. 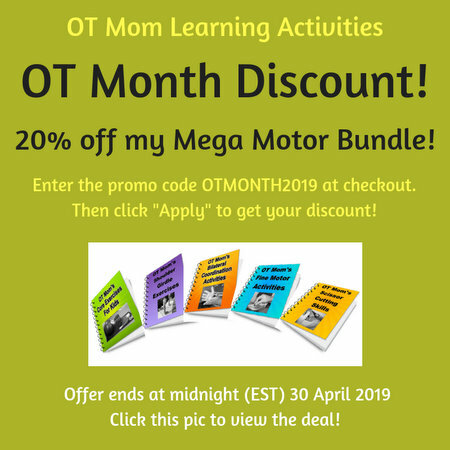 And what is doubly exciting, is that the challenge of this activity appeals to older children, tweens and teens who feel "too old" for the regular therapy games. If you are already excited, you can visit the Kaleidograph site here, but first take a look at its benefits. 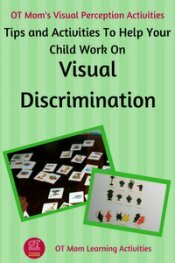 Your child will be using (and boosting) figure-ground perception and visual discrimination skills when they study the picture to discern the different elements of the design. They need to pick out the colors that were used as well as the design of the card - sometimes there is more than one design in a specific color. And sometimes there is only a tiny fragment of one color showing! The black and white sets (called Op Art and Contrast) are more demanding from a visual discrimination point of view, as the child has to look really closely to see the lines and shapes used. The designs are all built like crystals - 6 sided. That means that the orientation of the 4 sided card can affect the design. 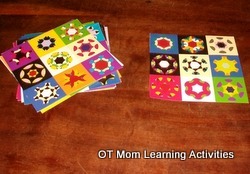 After picking out the card which is the correct design and color, the child then has to orientate and place it to replicate the exact design. For me, the spatial perceptual aspect is helpful and adds challenge, but it is not the most demanding aspect of the game. The visual perceptual and planning demands are naturally much stronger. Wow, wow, wow! That is all I can say about the level of planning and organization that is demanded at times. 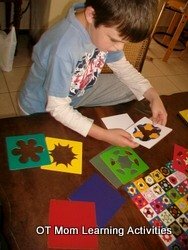 Not only does your child need to pick out the colors and designs used, but then has to LAYER the cards in the correct order to make the design "work". Not as simple as it looks! 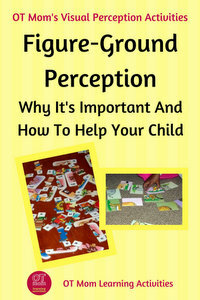 Your child needs to analyze what aspect is not "working" and then decide on a plan of action to remedy this. "Try turning the card sideways." "Try putting the card under the other one and see if that helps." "Is there another card with the same color but a different design? Maybe that one will help!" 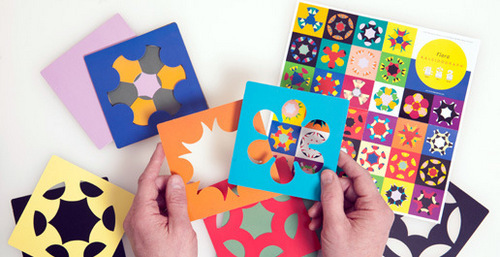 I thought this aspect of Kaleidograph was brilliant! If your child is naturally disorganized and/or a poor planner, the sight of a POSTER full of designs is completely overwhelming. My disorganized child struggled to know where to start, and jumped from one to another without much direction. 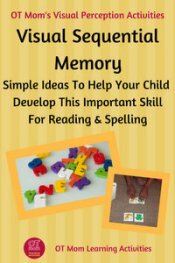 These will be much more manageable and it is actually really rewarding for your child to be able to say "I finished all the designs on this card today!" 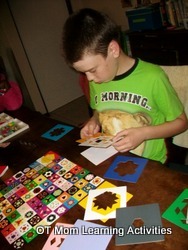 Solution 1: make simple designs using just 2 or 3 elements and take photos, and have your child copy from your photos. 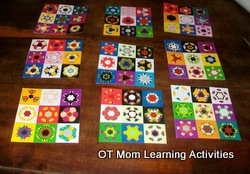 Upgrade to include more colors and elements as your child improves. Solution 2: Buy 2 sets of the same box (therapists could do this easily in a group practice) and make a simple design with one set that your child can copy with the other set. You can try the concept out online to catch a glimpse of the fun. But holding the cards in your hand is much more rewarding, and the therapy advantages of copying a design can only be done with a set in your hands! If you live in the US or Canada, you can browse here to find a store near you. Or get one shipped from Amazon directly to your doorstep. For your convenience, I have linked to these products on Amazon - I receive a small commission if you purchase something through the links, which helps support this site. However, you are under no obligation to purchase anything!